Charlotte Dome is a beautiful and remote 1,200-foot-tall granite dome in the Sierra Nevada Mountains of Kings Canyon National Park in California. The awesome South Face route (5.8) is included in Roper and Steck's Fifty Classic Climbs of North America and is certainly deserving in its inclusion in this list. The long 12-mile approach from the east over Kearsage Pass (11,800') to the base of the climb deters many climbers but the climb is well worth the work to get to it. Neither Bill nor I had climbed this route before but had heard nothing but great words about it so it was naturally included in our list of climbs for this trip. Again, we would rely on the wonderfully detailed SuperTopo guide for our climb of Charlotte Dome. After hiking down and out 8 miles and 4,300 feet from Iceberg Lake near Mount Whitney that morning after our climbs of the East Buttress on Mt. Whitney and the Fishhook Arête on Mount Russell, we drove from Lone Pine north through Independence to the Onion Valley trailhead by 2:00pm. We packed up our climbing gear and overnight gear and began the 12-mile approach west to Charlotte Dome around 3pm. Signs at the trailhead stated that overnight permits were required but did not say where these permits could be acquired nor what the penalty for overnight camping without a permit was so we just started hiking settling on a little civil disobedience. We also didn't carry the required "bear proof canister" with us as our bear can was quite heavy and after carrying it to Iceberg Lake earlier in the trip, I didn't really want to carry it again. We did carry a bag and 100 feet of accessory cord for hanging our food and that seemed more than adequate. The afternoon hiking wasn't nearly as hot as we had expected and we covered the four miles to the top of the Kearsarge Pass (11,800') by 5pm. From the top of the pass we could see the top of Charlotte Dome some eight miles away and were slightly discouraged at the distance we still had to cover. On the bright side, we had most of the elevation gain behind us and it was mostly downhill to the campsite from there. We quickly moved down hill past a number of scenic lakes down to Charlotte Lake. Beyond Charlotte Lake we continued down canyon to a low-point of 9,740' before climbing again on a rough climber's trail to the fantastic campsite at 10,140 that is referenced in the SuperTopo guide. Weary from the long hike, we arrived at this campsite just as it was getting dark at 7:30pm after 4.5 hours of approach hiking. We immediately went into efficiency mode and setup our single-wall tent before Bill went to pump water at the nearby spring for the next day and I cooked up a dehydrated meal for dinner before hanging the food and hitting the sack. We awoke around 6am and ate a cold breakfast before starting the short descent to the base of the climb. The view of the south face of the dome in profile from camp was awesome. We were both stoked to start climbing! From camp we headed west across the spring following a faint and lightly cairned trail to the slabs on the dome's east side. Easy descending on the slabs took us down and right towards the base of the climb. During our descent Bill said, "Damn, I forgot my helmet!" I thought about it and realized I had forgotten mine too. We had stashed them in my overnight pack for the previous night and once out of sight, they were certainly out of mind. There was no one else on the dome that day and the potential for rockfall on this dome seemed minimal so we carried on thinking about how cool we'd look in the photos sans helmets! It's all the rage, you know, as I rarely see helmeted climbers in the magazines. Preoccupied by our thoughts about forgetting our helmets, we descended about 150' lower than we needed to and had to traverse and climb up a bit back to a decently cairned climber's trail to the base of the climb. Checking the topo we realized we were at the base of the climb at 7:10am. The first pitch was supposed to be 5.6 but looked much easier up to the tree belay so we opted to solo it. This being our first dome climb, we very quickly learned a major lesson about domes: the lower pitches can look deceivingly low-angle but in reality things quickly get difficult. I had started up the pitch in my approach shoes and about half way up realized that the rock was steeper and less featured than it had looked. I stopped on a small, inconvenient ledge below some friction moves to put on my rock shoes. Bill being the wiser of the two of us had already put his rock shoes on and cruised past me with a look of, "See, I told you so." 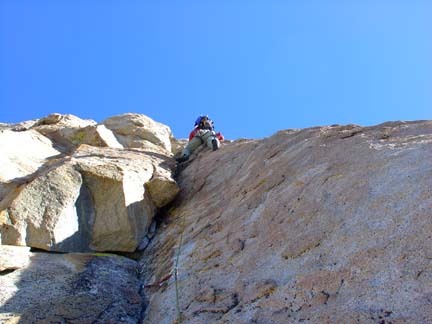 Once at the top of pitch one, we flaked the rope and Bill headed up the 5.4 crack and block climbing past some bushes on his left to sloping belay ledge. 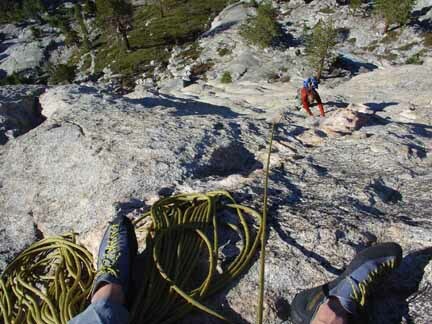 I quickly joined him at the belay and headed up pitch 3 which was some relaxed 5.5 face climbing a dished ledge with a small crack that took a couple of nuts for a belay anchor. Bill following on pitch 3. A fixed nut in the crack offered a third placement for my belay anchor. Bill followed up and then led up pitch 4 on some 5.5 face climbing with few opportunities for pro. The SuperTopo shows a 5.5 chimney but Bill completely missed that staying on the face to the left of the chimney before traversing over to the good ledge below the awesome 5.7 layback flake of pitch 5. I followed up and carried on to lead up to the layback moves of pitch 5. The flake is super positive and took pro nicely and I very much enjoyed leading pitch 5. I topped out after a much-too-short pitch of 80 feet below the crux 5.8 "Slot" of pitch 6. Bill had the next lead and must admit I was a bit jealous. Bill leading the crux 5.8 "slot" pitch. The "Slot" was steep but the crack looked great for both pro and holds. Bill lead up and placed the #3 camalot in the crack just below the crux moves before moving up. Using the crack for his hands and stemming with his feet he moved smoothly through the crux moves to the enjoyable crack and featured face climbing above. With our 60m rope, Bill linked pitches six and seven and setup a belay just below the next 5.8 crux pitch, pitch 8. Following Bill on pitches 6 and 7 was an awesome time and I knew my fun would soon come on pitch 8 which is described as "awkward and interesting 5.8 face and crack climbing in a chimney-type feature with thousands of feet of air down to Bubb's Creek." I'm not a big fan of chimneys. I lead up pitch 8 and immediately noticed the huge exposure as I traversed right for a short bit from the belay to get to the base of the chimney. I do love exposure though, so I was enjoying this. The climbing was a bit awkward only in the sense that reaching into the chimney to place pro was a bit of a stretch but generous knobs and plates on the steep face outside of the chimney made the climbing very comfortable albeit it very airy! I really enjoyed this pitch as well. As I got higher I didn't see any decent belay ledges before running out of rope so I setup a strong but very uncomfortable belay in a crack above and left of the chimney. Bill followed up and complimented the lead before heading up the 5.6 and 5.7 face climbing of pitch 9. Some cracks in the early part of pitch offered the last pro placements before 40 feet of run-out 5.7 friction face climbing. While I enjoy run-outs on friction, Bill doesn't share the same affinity for that type of climbing but still made it through the pitch nicely. When I arrived at the belay he stated that pitch 9 was a bit spooky with the run-outs. I would agree with that statement. We were now poised below the famous "Furrows" of pitch 10 and it would be my lead. The Furrows are awesome water grooves in the face of the dome that offer delectable features for climbing. Some of the furrows were so deep one could step comfortably inside to take a no-hands rest. In a few places small bushes protruded from the furrows. Leading this 5.7 pitch was pure, unadulterated fun as the face was steep but the very positive flakes and edges of the furrows made the climbing easy. Good cracks offered nice protection and I was able to sling a flake or two as pro. I arrived at the alcove for a very comfortable belay to bring Bill up. By the smile on his face, he very much enjoyed the climbing as well. Bill topping out on the Furrows pitch. Super fun climbing on awesome features. We weren't far from the top now which was both good and bad. Good because it's always nice to top out but bad because the climbing was so much fun we didn't want it to end just yet! Bill took off up pitch 11 which involved a short 5.4 layback and traverse to the left to easier 3rd and 4th class ground to just below the summit pitch. As I arrived as his belay, I eyed the remaining climbing. The SuperTopo suggests taking 5.7 fins left of the "steep gold face" to the top but I really liked the look of the steep gold face with all of its features. I decided that's where I would head moving up the lower angle cracks and ribs to the base of the steep gold face went smoothly. Transitioning onto the face was the most difficult part of the pitch but was no harder than 5.8. Once on the featured face the climbing resembled that of the furrows pitches with tons of knobs, flakes and chickenheads to choose from and went at nothing harder than 5.7. 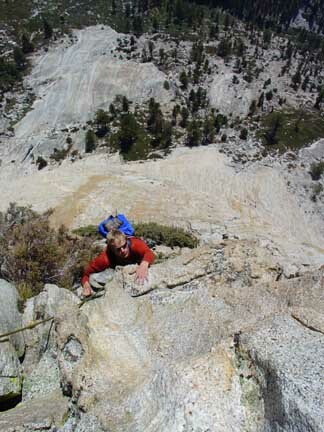 I ran out of rope all too soon and setup a belay just below the third class, exposed ridge to the summit. Bill followed the steep, gold face and then continued on up to near the summit before taking in the rope and pulling me up the rest of the way. We unroped there and scrambled to the summit of Charlotte Dome at 1:30pm. It had taken us 6 glorious hours to climb the route. The views from the summit were awesome indeed. We snacked, signed the register and then headed back down to our camp. The descent north and then east down easy slabs went quickly and we picked up on a faintly cairned climber's trail back to the camp. We packed up camp, ate a late lunch consisting of rehydrated cheesy, broccoli mashed potatoes and then at 3:30pm we embarked on our 4.5 hour hike back to the Onion Valley trailhead arriving back at the car at 8:00pm. The camp at 10,140' that is described in the SuperTopo guide truly is a beautiful campsite with a great view and a lush spring nearby as a great water source. We wished we had more time to spend at that camp and I would highly recommend this campsite for the climb. Then again, you could skip camping altogether and follow in the footsteps of Peter Croft and leave the Onion Valley trailhead at 6am, solo the south face to arrive at the top of the dome by noon and get back to your car before dark for a wonderful day trip! Written by Jason Halladay on 16 November 2005.